Scor-Pal has all the grooves you need to make scoring, measuring and folding your cardstock projects quick and easy. You'll achieve a precise and crisp fold every time. It features a raised fence around three sides with easy to read measurement markings at the top at 1/8 inch to 1 inch intervals. The companion Scor-tool comes with your board and snaps securely in place at the top of the board for convenient storage and easy retrieval. The actual scoring surface is 12x12 inches. Comes with one 14x12- 3/4 inch scoring board and one plastic scoring tool. 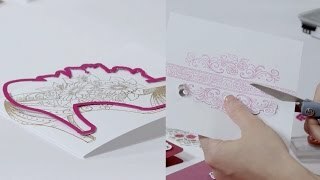 Simple Steps to Creating a High-Heel Shoe Card!